Is mole with hair a non-cancerous one? 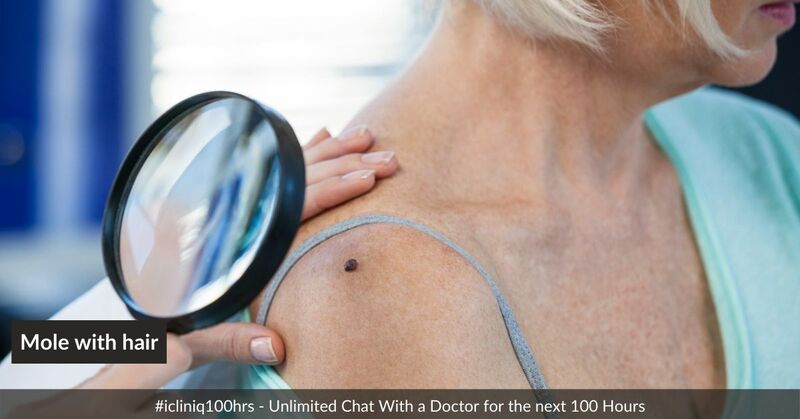 iCliniq › Ask a doctor online › Answers › Dermatology › Melanoma › Is mole with hair a non-cancerous one? Q. Is mole with hair a non-cancerous one? About a month ago I vigorously scratched off a mole that was on my back. While lifting weight and lying on my back, it got irritated. I have had the mole for at least seven years. It has always been relatively big and light brown shade. However, when I picked it off it went away at first, then about a month later it has gradually started to come back. Now, it is not even, looks irregular and varied in color a little bit. It has also grown a hair in it. In interner, I searched pictures of melanoma and freaked out. I do not have a history of skin cancer in my family. I am 24 years old and I go to the beach and pool quite often. I have not always worn sunscreen, but most of the time I wear SPF 15. I am not on any medication. • I got a new birthmark like thing. Is it melanoma? • Is mole with hair a non-cancerous one? • There is a hole below my stomach with smelly pus discharging. Help me. You should not have scratched it, because the chances of malignancy increase in otherwise benign mole. Presently what I can see is the erosion (attachment removed to protect patient identity) so at this stage even dermoscopy would not be able to find out malignancy. So, best policy at this time is to use Mupirocin ointment twice daily in order to subside or prevent infection. Once the erosion is subsided then you can go for dermoscopic and histologic examination to confirm the nature of mole. I have read different things in online saying that a hair cannot occur in a melanoma. Because, the cancer cells would kill the hair. I have read others saying this is not true. What is your answer for this issue? Since my mole has a hair growing out of it, does that increase or decrease my chance of it being a melanoma? Hair growth has nothing to do with malignancy. Melanoma is a tumor of melanocyte present in the basal layer of epidermis while hair emerges from different entity known as hair follicle. So, in advanced stage due to infiltration of tumor cell in hair follicle may cause hair loss but it does not always happen. This is why none of scientific criteria for diagnosing melanoma has presence or absence of hair. New moles are appearing in my palms. Is it melanoma? The mole on my arm has two different brown shades. Give me your opinion please. What can cause sudden tingling and itchy sensation?